This Sunday, October 14, is the 952nd anniversary of the Battle of Hastings – the history-shaping encounter, told in the Bayeux Tapestry, which marks the last successful invasion of Britain and the end of Anglo-Saxon rule. To mark this event, Total War developer Creative Assembly has released a video which both tells the story of the rise and fall of the Anglo-Saxons, and re-creates the Battle of Hastings in Thrones of Britannia. It probably would’ve been funnier if they’d done it inn Warhammer 2, but we’ll take what we can get. The documentary also includes an interview with historian Dr Neil McGuigan of the University of St. Andrews, who lent his knowledge to the development of Thrones of Britannia. It charts Alfred the Great’s victory over the Viking invaders at the Battle of Edington in 878 AD to King Harold getting an arrow in his eye in 1066. 200 years of British history in seven minutes, that’s not bad at all. All battle scenes are lovingly remade in the game’s engine, which reminds us a lot of Time Commanders, the BBC show which used the Total War engine to challenge wannabe-Generals to remake history. You can check out the video below, in all its battle-soaked history-shaking glory. We’re just sad they don’t actually show someone getting shot by an arrow in their eye, but maybe that’s too gruesome for a family-friendly documentary. 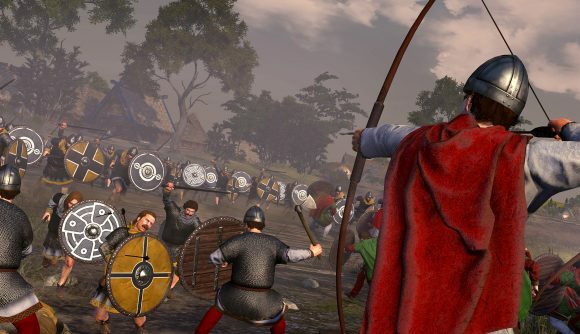 We enjoyed Total War Saga: Thrones of Britannia a lot, with our reviewer giving it an 8 score back in May – although many fans had a bit more of a mixed reaction to the game, prompting Creative Assembly to look to improving on it with updates.